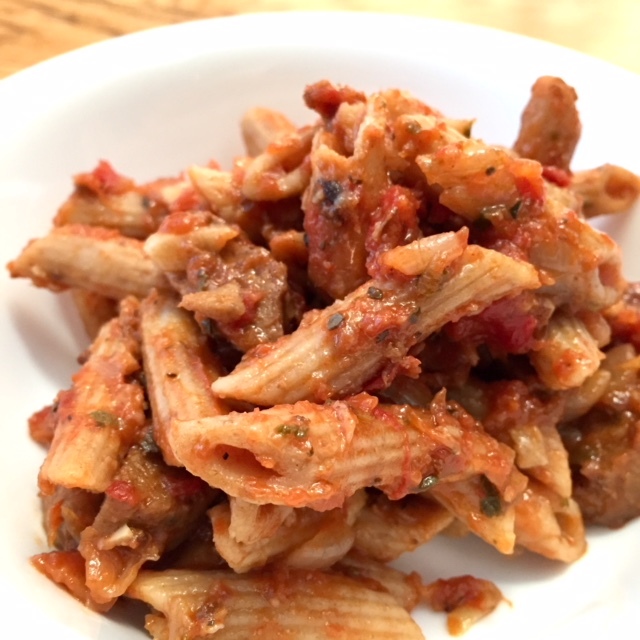 Instant Pot Veggie Sausage Pasta is simple, tasty, and as hearty as pastas come! True comfort and lots of rich flavors in a bowl. After setting up my Instant Pot, I immediately Googled recipes and blogs catering to this new device. I also asked friends for their suggestions. The idea of creating my own dishes never even came to mind. Why? Well honestly, I was a little scared. Scared of it blowing up in my face (literally! ), scared my food wouldn’t turn out tasty creating unnecessary waste, etc. You get the picture. One day I ditched my fears and decided to try my hand at lasagna soup…in the Instant Pot. And guess what…it didn’t turn out as expected. BUT it still tasted good. While I didn’t have a soup to serve, I did have some pretty delicious pasta that my husband compared to Hamburger Helper, one of his favorite childhood meals. Lesson learned – when it comes to the Instant Pot, just go for it! Since then, I’ve tried recreating this pasta a few different times. I’ve tried different pastas, different amounts of liquid, and different cooking times. And FINALLY, I have a recipe to share. Seriously, you guys. 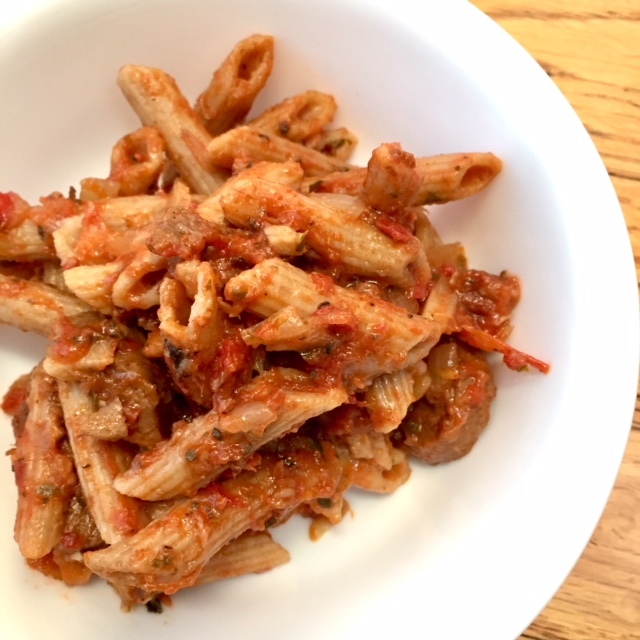 This is one of the easiest and tastiest pasta dishes I’ve ever made. In fact, as we were eating it for dinner this week, Vishnu said, “This is so good, Par.” Totally unprompted! That’s how I know this recipe is a winner! Anyways, enough chit chat. If you own an Instant Pot, give this recipe a try and let me know what you think. If you don’t, try to recreate it on the stove top (it make require a little more time and a few more pots). Add olive oil and after 2-3 minutes add onions and garlic. Stir occasionally until onions are slightly translucent (4-5 minutes). Add sausage and stir to combine. After 2-3 minutes, add tomato and basil pastes and mix well. Add diced tomatoes, oregano, salt, pepper, and red chili flakes. Stir to combine. Add pasta and mix lightly before adding veggie broth. Ensure pasta is submerged in liquid. Pressure cook on manual at high pressure for 7 minutes. Turn off heat and wait for a 10 minute natural pressure release (wait 10 minutes after turning IP off and then manually release pressure before opening lid). If you prefer your pasta more al dente, pressure cook for 4-5 minutes instead. Stir pasta to combine, serve, top with cheese, and enjoy! *If you want to make this a meaty dish, use your favorite ‘real’ Italian sausage. **I highly recommend using whole wheat or whole grain/multi-grain pasta versus regular or alternative (brown rice/quinoa, chickpea, etc. ), as it holds up to the pressure cooker and keeps its texture/shape nicely. ***I recommend a ricotta/mozzarella/parm combo, but anything goes! I also love feta, and Vishnu’s tried and true fav is sharp cheddar. I LOVE LOVE LOVE the Instant Pot. It’s made meal prep and cooking so much easier, and I can honestly say it’s made me a more adventurous cook too (thanks to all of the awesome blogs out there). If you’re on the fence about this seemingly intimidating device, just go for it! My prediction – 2018 will be the year of the Instant Pot! Your turn – do you own an Instant Pot? Any favorite recipes/blogs? PLEASE share in the comments! No portion of this post is sponsored. However, affiliate links are included. There is no extra cost to you, but I do receive a small commission on anything you buy through my links. Thank you for reading and supporting My Inner Shakti! If there’s one thing all women of South Asian descent can agree on, it’s that excessive hair growth is a real thing and it’s a b****. We all have our horror stories! Trust me, two of my coworkers and I talk about this very topic almost every day. Like I said, it’s a real thing. The only difference between now and when we were young girls with long sideburns, overgrown eyebrows, and hairy legs/arms is that we can do something about it on a regular basis. I stood in front of our bathroom mirror with the door locked behind me. I inspected my super thick sideburns. “How can I get rid of them?,” I thought. Then then idea hit me. I grabbed a pair of scissors and started snipping away. For some reason, I thought this was the answer, not realizing that you can’t snip the roots of your hair away. I went from having long hairs growing down the side of my face to short stubbly hairs in their place. I was horrified but didn’t think anyone would notice. Of course, my mom noticed RIGHT AWAY, and she was mad. That’s when I lost my s***. I started crying and yelling, “God wanted to make me a boy but changed his mind at the last minute!! !” Oh the drama! I’m pretty sure my mom laughed! When I got older, my mom took me to get my eyebrows threaded and my side burns waxed. The relief! I no longer felt like a hairy tarantula. Soon thereafter, my aunt taught me how to thread my own upper lip and chin. She probably doesn’t know it, but she changed my life. I could now remove my facial hair at any time. LIFE. CHANGING. Then about 15 years later, a friend introduced me to the idea of homemade wax and waxing my own sideburns. She even made me my first batch of wax! Again…LIFE. CHANGING. I’ve been using this homemade wax on my sideburns for years now. It’s easy to make, works like a charm, and only requires cloth waxing strips to help with the hair removal process. Not sure why it’s taken me so long to share this recipe. Probably because my last batch lasted forever, and I didn’t have to make a new one until this past weekend. Side note – Pregnancy hair growth is a real thing. My sideburn hairs are growing at an exponential rate! 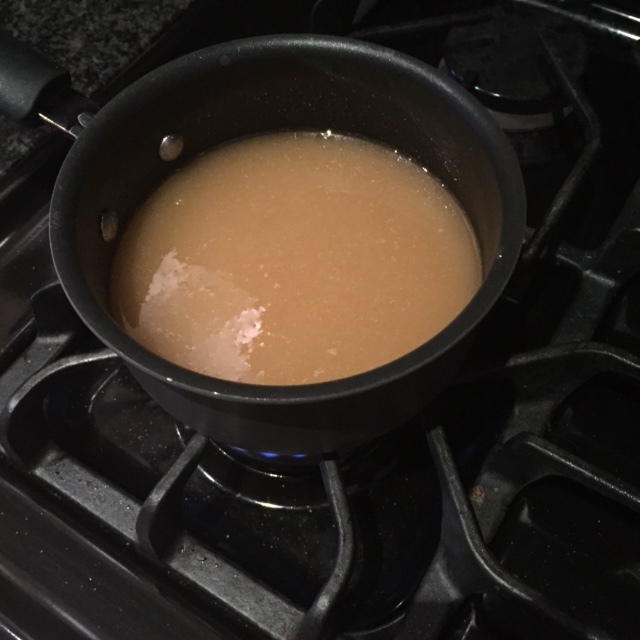 To make the mixture: Add the water, lemon juice, and sugar to a small saucepan and place over medium heat. Stir together and let the mixture come to a boil. Turn down the heat, stir again and let it come to a boil one more time. The mixture should be amber in color at this time. Take it off the heat and let it cool down for a few minutes. To use the mixture: Take a butter knife, dip into the wax mixture, ensure it’s cool enough to apply, and then apply in the same direction of hair growth. Quickly place a cloth strip over the wax, press down and rub the strip a bit, and then pull off in the opposite direction of hair growth. Repeat until hair is removed. 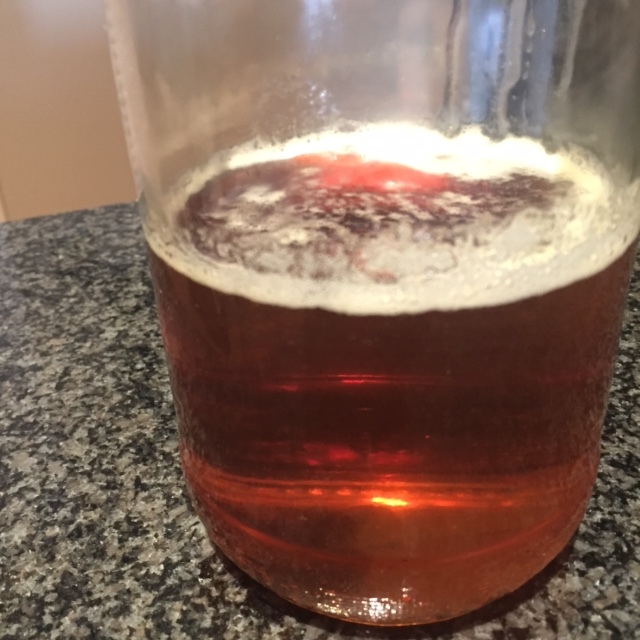 To store the mixture: I used a glass jar. You can use whatever kind of container you want. Just make sure it’s microwavable. That’s key for reuse! I’m so glad my friend introduced me to this recipe and method. I’ll never resort to scissors again! Your turn – what’s your go to hair removal method? Peanut Butter Banana Oat ‘Cereal’ is a delicious, easy to make, and filling concoction that’s perfect for breakfast, lunch or dinner. What was your absolute favorite food growing up? Pizza? Hot dogs? Mac n’ cheese? Cookies? Me? None of the above. My favorite food was cereal. Yes, you read that correctly. I loved the ritual of pouring myself a big bowl of cereal (anything from Kix to Lucky Charms to Corn Flakes) and milk and digging in. My love affair with cereal continued well into adulthood. In college, my roommate Roshni and I were known for coming home from class, sitting down at our dining table with a half gallon of milk and a box of cereal, and going to town. Don’t get me wrong, I still love cereal. In fact, during my last trip to the grocery store, I strongly considered buying a box of Banana Nut Crunch (my favorite as an adult). But knowing one bowl at a time would never be enough, I chose not to go down that path. Also, while most cereals aren’t the worst choice from a nutritional perspective, they’re certainly not the best. Especially when you can never stop at one bowl. What’s a cereal loving girl to do? Make her own version using simple and healthy ingredients. Duh! You guys! I eat this ‘cereal’* at least 1-2 times a week and usually for dinner. It’s super filling and so delicious. Personally, I enjoy the texture a lot – the perfect balance of creamy from the peanut butter and chewy from the oats. The flavor is also on point – the nuttiness from the peanut butter, the sweetness from the banana, and the slight spice from the cinnamon. And of course, you can’t forget the cold almond milk bringing everything together. LOVE! I’ll stop rambling about cereal now and share my recipe. I highly recommend you give it a try ASAP. You won’t regret it! 1. 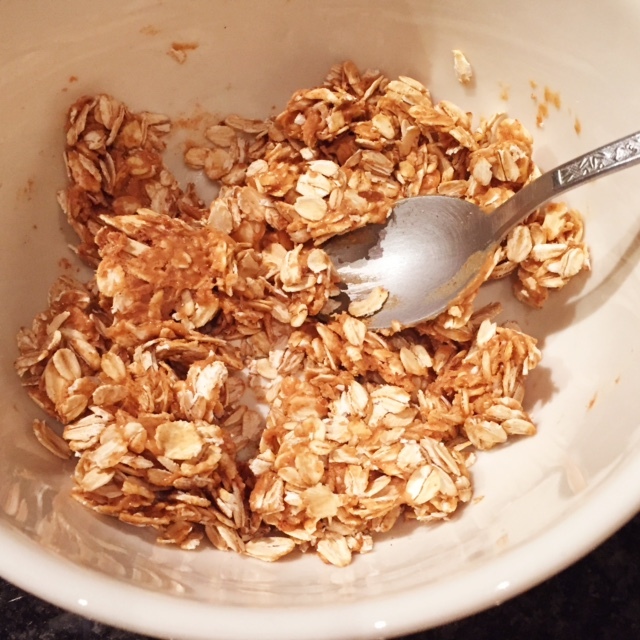 In a cereal bowl, mix together the oats, salt, and cinnamon. *I know this doesn’t fit the traditional definition of cereal, but this is my blog, so I’ll define it however I want! Your turn – are you/were you a cereal person? Favorite kind? 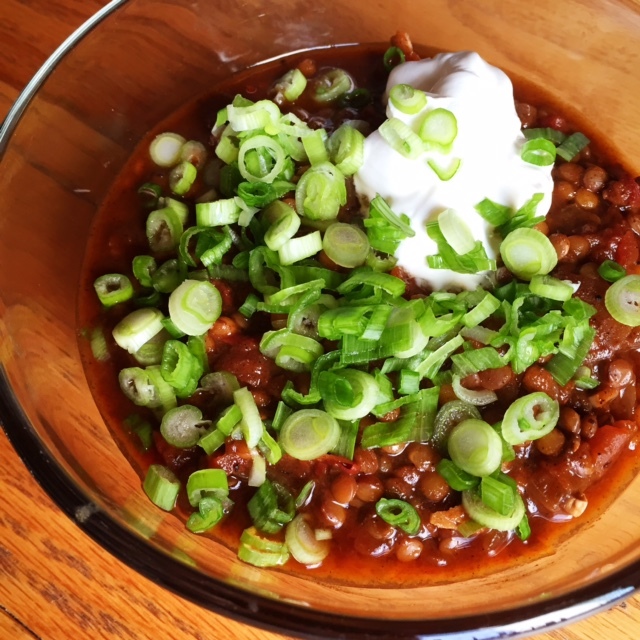 This vegetarian lentil chili is hearty, aromatic, and delicious. A big bowl topped with lots of green onions and a dollop of sour cream is comfort food made easy. I’m all about easy weekday recipes. Why? Because I just don’t have the time and energy to create/cook complex dishes, especially after a full day of work. And by easy I mean meals that require minimal ingredients and are ready in under 30-45 minutes ish. When I first told Vishnu that lentil chili was on this week’s menu, his reaction was less than enthusiastic. He’s not a fan of non-Indian lentil dishes, but because this recipe fits my weekday meal criteria, I ignored him and decided to make it anyways. I’m so glad I did because not only did I find this chili to be absolutely delicious but so did Vishnu! He gobbled it up (two nights in a row!) without a single complaint about the star ingredient. 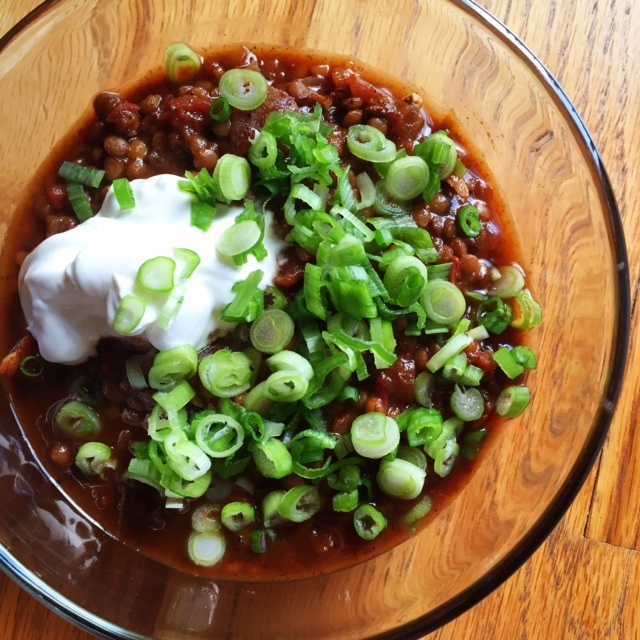 Before I share the recipe, I just want to say that this chili is SO easy to make it’s stupid. I will say that I had to restrain myself from adding more veggies and spices. If you find yourself questioning this recipe, don’t. It’s perfection stems from it’s simplicity! And PLEASE don’t omit the sour cream and green onions! They add so much to the flavor profile. Trust me! Heat oil in a large saucepan over medium heat. Add onion and saute for 2-3 minutes. Add garlic and saute for 1-2 more minutes. Add chili powder, ground cumin, dried oregano, and cayenne pepper. Stir together until combined. Add 4 cups of vegetable broth, lentils, and tomato puree. Increase heat and bring to a boil. Reduce heat to medium until lentils are tender. Stir in 1/4 cup of green onions. Season chili with salt and pepper. Before serving, top with more green onions and sour cream. Enjoy! Are you a fan of chili? What are your favorite toppings? …and a less staged version on Snapchat (username –> myinnershakti). A totally unexpected thing happened after doing so. I received more than the usual number of messages and emails asking for my recipe. Honestly, this is a “recipe” because I went into it with no plan in mind. And because it was way too easy to make (like too easy for my own good!). 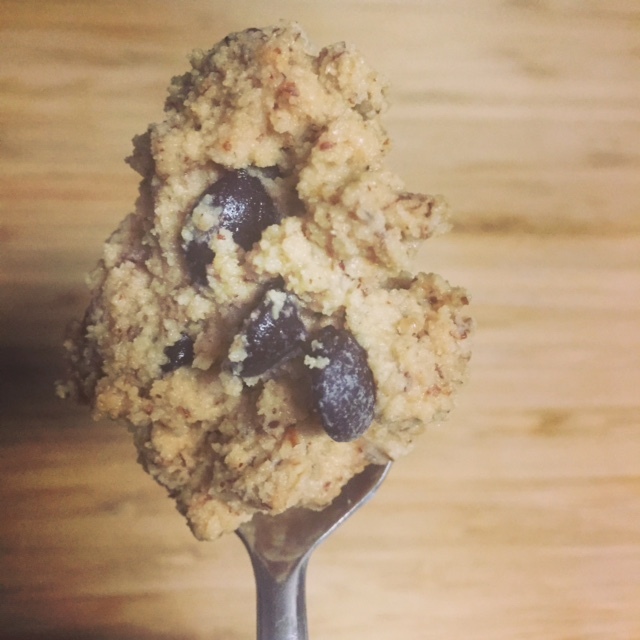 Before I share said “recipe,” let me tell you how this edible vegan chocolate chip cookie dough came to be. P: Are you craving something sweet? V: Par, we just ate. P: What’s your point? Hunger has nothing to do with dessert. P: Fine, I’m going to make something sweet for ONE. And I will not share! I finished the dishes and immediately started rummaging around our pantry and fridge. My first instinct was to find a cookie recipe for one, but in all honesty, I didn’t want to turn on the oven. But of course, now I had cookies on my mind. I thought about how I could make something that tasted like a cookie but didn’t require baking. It was in that moment when my edible cookie dough was born! This little concoction was delicious and satisfying in a way most sweet treats aren’t (re: healthy fats!). The best part is that it took less than two minutes to whip up a bowl of cookie dough goodness! I highly recommend you experiment and use this “recipe” as your base. If you’re feeling adventurous, try different flours, nut butters, and add-ins! You can’t go wrong! In a small bowl, mix together the almond meal and coconut flour. 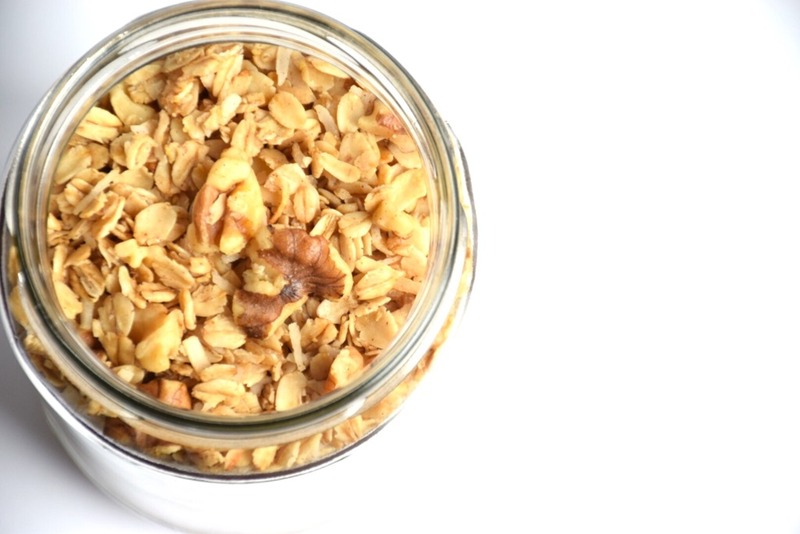 Work the peanut butter in with the flours until it resembles a crumbly mixture. 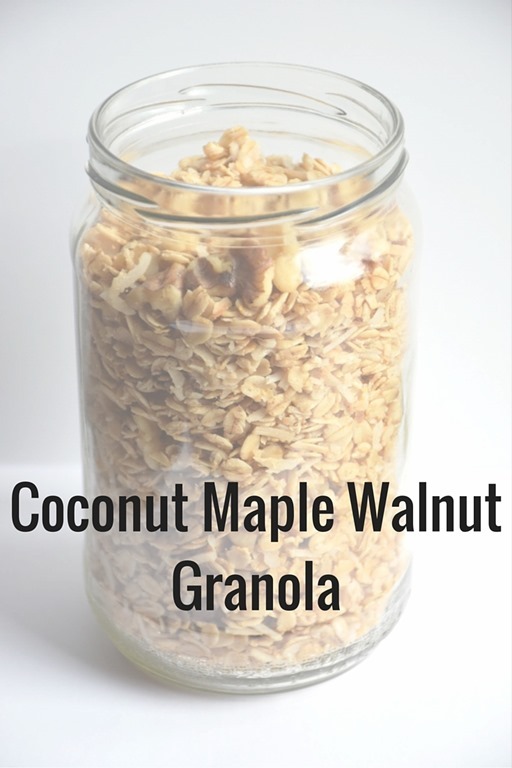 Add the wet ingredients (almond milk, maple syrup, and vanilla extract) and mix until combined. Fold in the chocolate chips. Enjoy! Do you know what I love most about Vishnu? Ok fine, maybe not the most but still…it’s high up on the list. He loves food as much as I do. He loves trying new restaurants, new cuisines, and the weird things I make every now and then. When it comes to food, we’re on the same page! I don’t know what I’d do if he was a picky eater or didn’t like to eat out and try new things. SO thankful for my Vishnu! When I suggested that we celebrate Thanksgiving a little early this year (I’m in Atlanta this week! ), Vishnu was totally on board. He even helped me put a menu together! Saturday was the big day, and because I knew we’d be eating some rich foods, I decided to start the day with a run. I then headed to Target and Trader Joe’s to do some grocery shopping. It was close to lunchtime when I got home and both Vishnu and I were getting hungry. Unfortunately, I was so focused on dinner that I forgot to think through what we would eat for lunch. After rummaging around the kitchen and coming up short, I asked Vishnu if he wanted to eat mac n’ cheese for lunch. This worked out perfectly because our dinner spread was quite the feast. Like Vishnu put it, we stretched out Thanksgiving and made it a day long event! So lets talk about this mac n’ cheese! It was so unbelievably creamy and gooey. 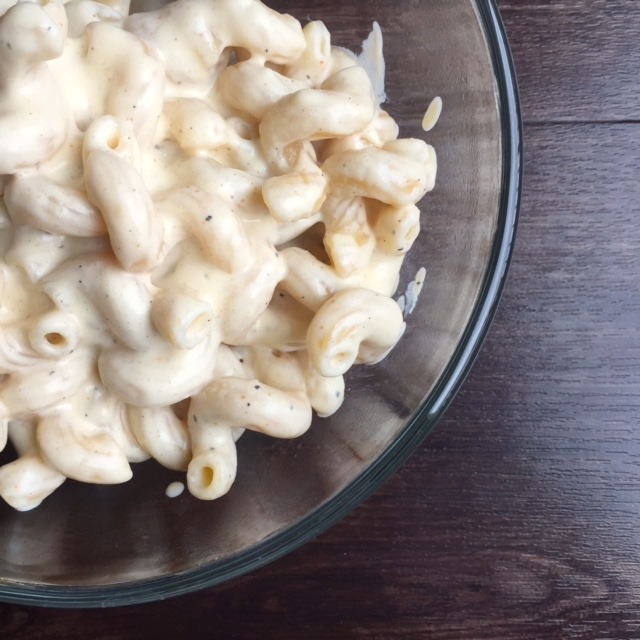 I used my Best Ever Mac n’ Cheese recipe as the base and made a few changes. I used whole milk instead of 2%, TJs gruyere and cheddar cheese blend instead of plain cheddar, and omitted the garlic altogether. I also didn’t bake it in the oven with breadcrumbs because I didn’t have any patience left for that step! This is really a must make recipe if you love cheese and pasta. So so good! We took a short break from eating and cooking to clean, pack, and watch TV (priorities!). And then I was back in the kitchen! Next on the list of things to make – corn muffins. These were easy because I used a box mix…Krusteaz I think. We like our corn bread/muffins on the sweeter side, and this mix definitely isn’t. 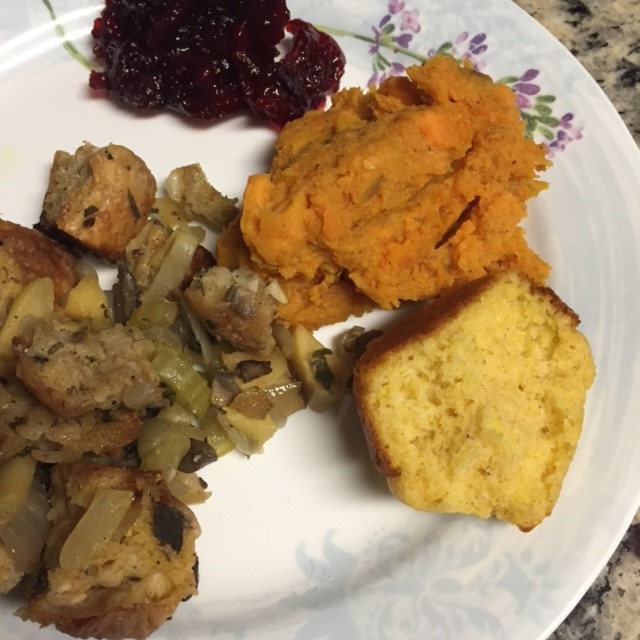 I wish I had remembered to pick up the TJs corn bread mix…it’s our favorite. While the muffins were in the oven, I started on the cranberry sauce using this Food Network recipe. There were a few changes of course! I used 3/4 cup raw sugar instead of 1 full cup, and I also added the juice of one lemon to the sauce. I could eat this stuff ALL THE TIME. It’s slightly sweet but more on the tart side and pretty much perfect on everything, especially corn bread! With the cranberry sauce simmering away, I prepped dessert since it required some set up time in the freezer. 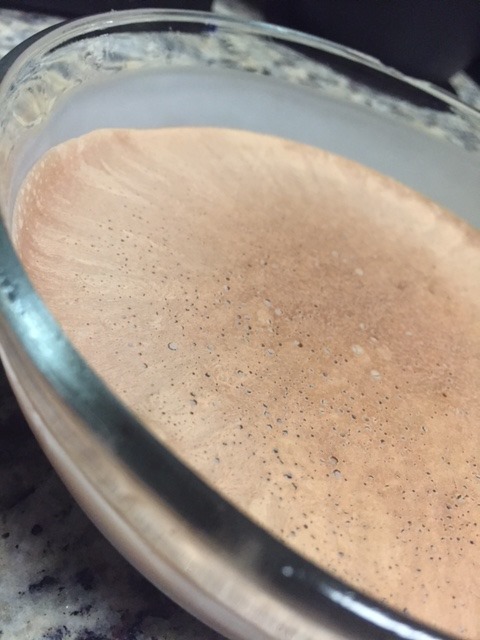 Vishnu originally suggested chocolate mousse for dessert, and while that sounded delicious, I changed things up and decided to make Brittany’s chocolate coconut tarts. Both Vishnu and I love the coconut and chocolate combo, and I figured a simple ice cream like dessert would be a great way to end our meal. And it was, except we were so stuffed and could only finish 3/4 of one tart. I’m secretly hoping Vishnu forgets about the leftovers I put in the freezer so that I can have some when I get back! 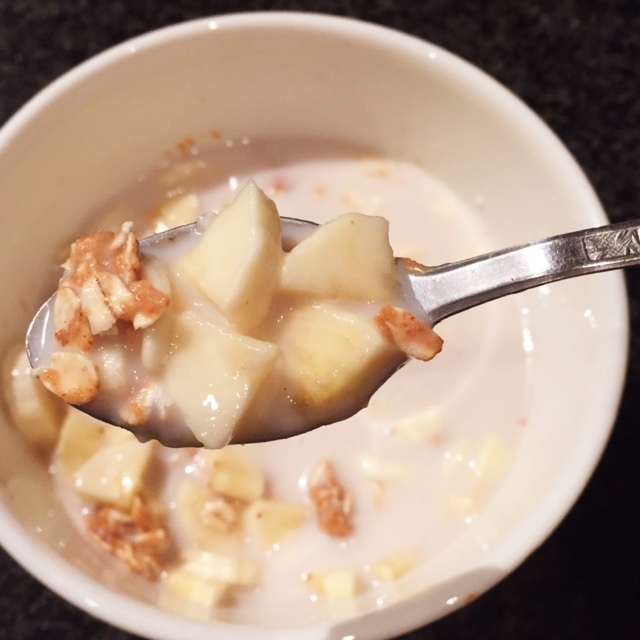 But this is another must try recipe if you’re a coconut lover…so easy to make! Next came the stuffing. I followed this Real Simple recipe, swapping multigrain bread for white and omitting the olive oil and chestnuts. The end result was really delicious. The sweet apple was a nice surprise, and I liked how the multigrain bread stood up to the rest of the ingredients. This recipe is definitely a keeper! I for sure thought Vishnu would want regular mashed potatoes this year, but he suggested a sweet potato mash instead. I found this super simple recipe and decided to go with it – only change made was using whole milk instead of heavy cream. Most mashed potato recipes suggest boiling the potato first and then mashing. This one was a one pot stovetop recipe, and I really appreciated not having to go through the extra step. And the potatoes were still just as creamy, buttery, and flavorful! The final thing on my list was roasted asparagus – olive oil, salt, and pepper. Done! Vishnu’s one big to do was a roasted chicken. Funny story about the chicken itself. I was secretly hoping TJs wouldn’t have a whole organic chicken because that would mean we could make something out of the chicken breasts at home. Well, they had lots of chickens. As I stood in the poultry section, I didn’t have a hard time picking the one I wanted, but I didn’t know how I was going to get the chicken in to my cart. I literally had a physically reaction when I thought about picking it up myself and almost asked the customer next to me for help. But that was borderline crazy so I decided against it. I then closed my eyes, took a deep breath, and picked up the chicken by it’s legs and gently tossed it in my cart. And then I almost cried! I’m not against Vishnu (or anyone) eating meat, but Food Inc. definitely came back to me as I stood in front of all those chickens. Anyways, Vishnu used his mom’s recipe to prep and roast the chicken. 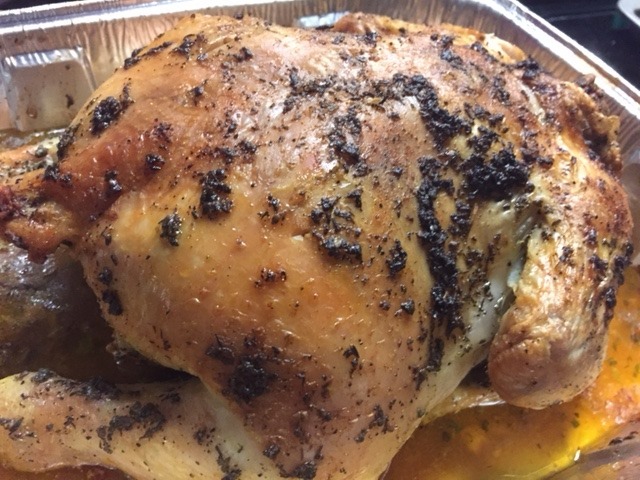 He mixed leftover fresh thyme and sage with butter and smeared it all over the chicken along with liberal amounts of salt and pepper. He then roasted the chicken at 375 degrees for 1.5 hours. He said it was perfectly moist and juicy on the inside…I’ll take his word for it! Our food babies and subsequent food comas forced us to go to bed early, which wasn’t a bad thing since I had an early flight to catch. All in all, Thanksgiving 2015 was a huge success! And because of my forethought, Vishnu now has a week of delicious dinners ahead of him. Lucky guy! What’s on your Thanksgiving menu (if you’re celebrating this week)?